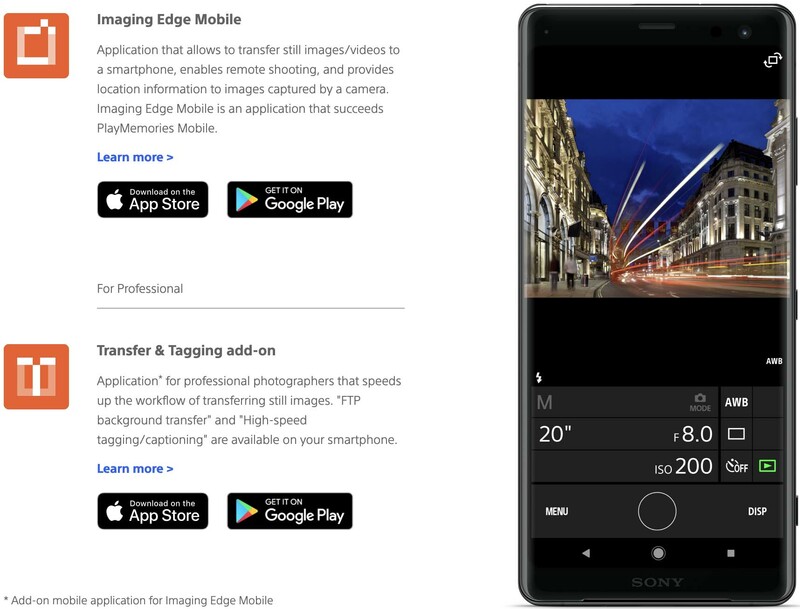 ・PlayMemories Mobile has been renewed as Imaging Edge Mobile. ・After transferring, you can immediately share your high quality images on social networks or through email. *1 Models that support PlayMemories Camera Apps can use this feature by installing “Smart Remote Control” (in-camera app) on your camera in advance. ・With cameras that have a location information linkage function, the location information acquired by the smartphone can be added to the captured image in your camera. For supported models and detailed operation methods, see the support page. ・Even with cameras that do not have a location information linkage function, it is possible to add location information acquired by your smartphone to the photos saved on your smartphone during remote shooting. ・This app is not guaranteed to work with all smartphones/tablets. ・Features/Functions available for this app vary depending on the camera you are using. ・For supported models and information on features/functions, see the support page below. Imaging Edge Preview on iTunes and GooglePlay. Transfer & Tagging Add-on Preview on iTunes and GooglePlay. This entry was posted in Software and tagged Imaging Edge Mobile, Sony Imaging Edge Mobile, Sony Transfer & Tagging Add-on, Transfer & Tagging Add-on. Bookmark the permalink. Trackbacks are closed, but you can post a comment.